Preparing For A New Winter! The trees are turning, revealing amazing fall colors of reds, yellows, pinks, oranges and browns… the garden survived the first frost and is winding down production. We built up the box stalls in the barn to ensure that the cow and horse had a warm and dry place to bed down at night. The days of fall are getting colder and shorter. We’ve been in Wisconsin for about three months now and it’s already time to start planning for the coming winter months. We talked about what it is we’ll need to get done before winter and I realized, as the discussion went on, how different the climate in Wisconsin will be from that of Arizona. In Arizona, we’d get snow… sometimes at least a foot in a good overnight storm, but it would typically melt off in a day or so and while it was cool outside, it was rarely bitter cold. I am thinking that those mild winter days are behind me with the move to Wisconsin! So, today’s blog will toss around our winter planning ideas and I would encourage hearing from all of you on how you’re planning for your winter months. First item on our list was to ensure a good food supply for Do and Cookie cow. 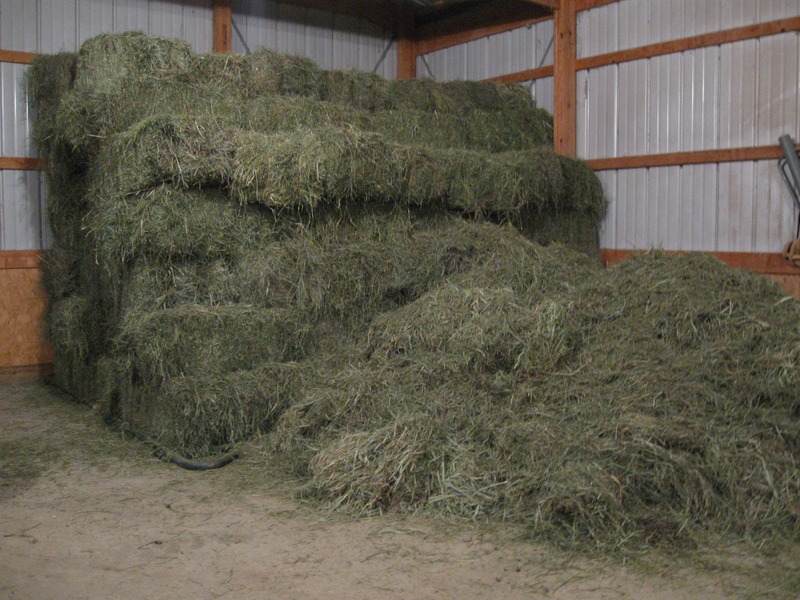 We did end up finding a great resource for hay. We purchased about 100 bales of Alf-Alfa and about 30 bales of grass hay.We hadn’t been here long enough to find a resource for used pallets… so for this year we used two 12′ x 5′ corral panels as an air gap beneath the pile. I am hoping it is enough to keep it from molding. So far, the bales we’ve fed have been lush and green with zero mold smell or evidence of too much moisture. We did stack this in the corner of the 30 x 60 pole barn / garage. One thing completed on our list!! Today’s big task is to go through the barn and garage to pull out anything that can’t tolerate freezing temperatures! I use Espree Aloe Herbal Fly Repellent on the cow and horse… this doesn’t tolerate freezing well so I’ve made a livestock shelf in the basement for this and other items I’ll pull from the tack room. 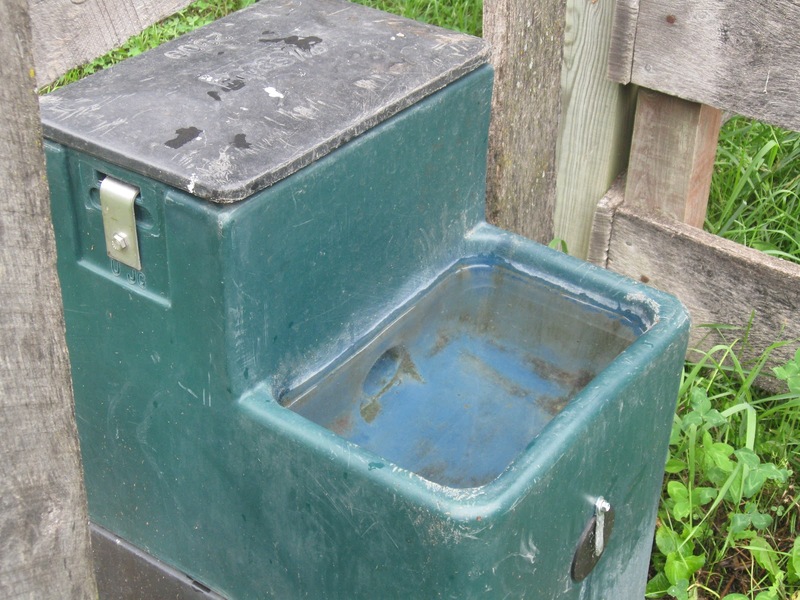 Ivomec, Blu Kote, etc… Really, any liquid items in your tack room should be pulled for the winter months to avoid container splitting or reducing the effectiveness of the product. Tack was another question that popped into my mind, though from what I’ve read on many forums, a good oiling in the fall and covering your tack will keep it safe from damage through the cold months. Water sources for Cookie and Do are another consideration for the Wisconsin winters. We have a heated water source. It’s an auto fill, tied directly to the well, and has a heater inside the housing to keep the water from freezing. While I am comfortable with this, and love that it has access from front and back (though not visible in the picture)… I’m thinking I want a back up water source in the barn. 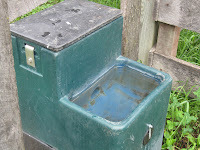 In Arizona, I used a large metal garbage can that I purchased specifically for a back up water source. I put a large rock in the bottom and set a submersible heating element on top of the rock. I used the rock just to create a larger heat source. We had temperatures in AZ that would dip to -9 degrees and this stayed at 40 degrees. As long as I can make sure that the furry kids have access to water, I’m happy!!! So, in summary… the furry kids have a warm place to sleep for winter… plenty of food…. and a good water source. All items that can freeze have been removed from the tack room and into the heated basement. Tack has been oiled and covered for protection. Have I missed anything that you can think of??? Happy Homesteading and I hope you all are enjoying the hot cider and amazing fall colors!!! This entry was posted in A New Homestead, Homesteading, Livestock Supplies, Poultry, Random Thoughts on October 6, 2012 by Homesteader's Supply.